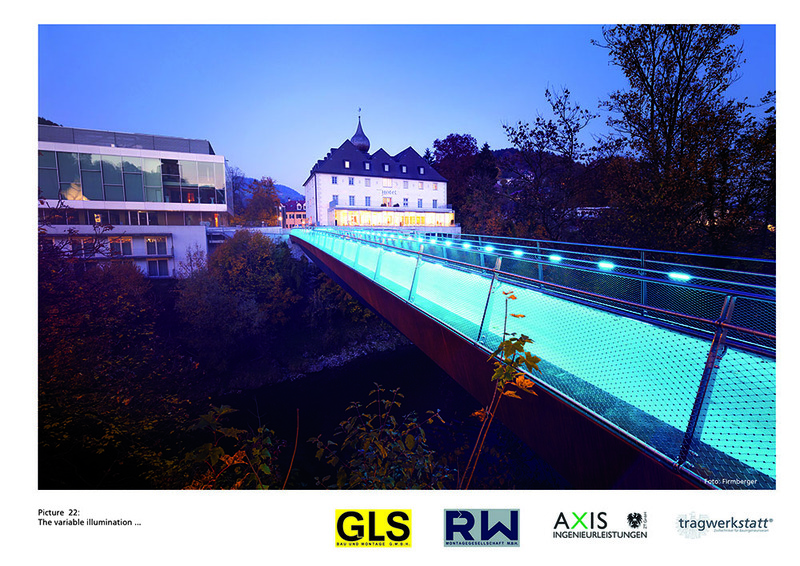 In the summer of 2014 the municipality of Waidhofen an der Ybbs decided on replacing the existing Ybbs bridge with a new structure. 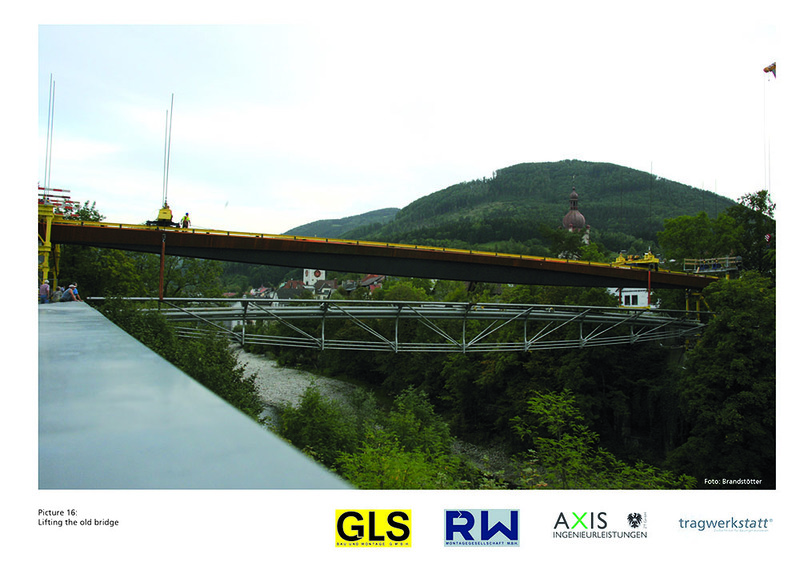 The tender was won by the project “Schlosssteg 2.0” by the project partnership Schlosssteg 2.0 (GLS Bau und Montage GmbH, RW-Montage GmbH) and the design team of Axis ZT GmbH and tragwerkstatt ZT gmbh. Following an intense design phase, construction started on June 24, 2015, and was finished on October 21, 2015. 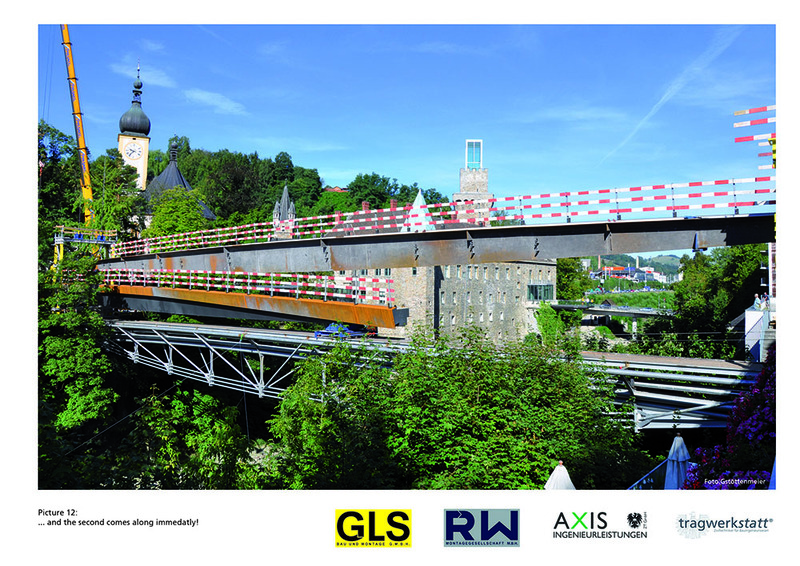 Schlosssteg 2.0 was designed as a steel construction, since this construction type allows for the quickest construction time whilst reducing the environmental impact to a minimum. Moreover, no other construction type permits such a slender construction, which was a decisive factor in embedding the bridge in its environment. 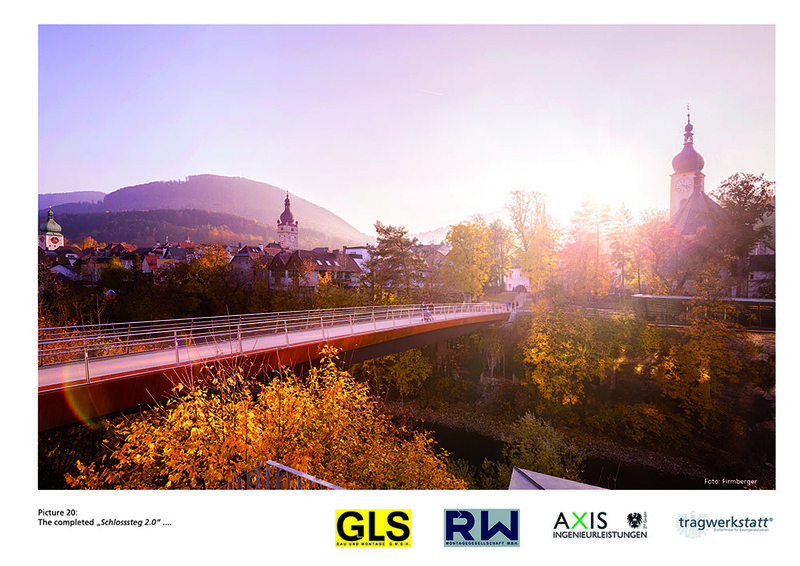 Bridges unite and expand our world, just as Schlosssteg 2.0 connects the two municipalities of Waidhofen and Zell, expands the sphere of many inhabitants and constitutes a key element in developing a city with short walking distances. This last aspect could also be complied with by manufacturing the bridge elements in the yard of RW-Montage, just 45 km away from the construction site. Waidhofen an der Ybbs, once a centre of metallurgy and member of the Iron Road, has a long tradition in iron and steel. Still today, the region has numerous metalworking companies. In this context, using steel was not only obvious but even contributed to identity generation. 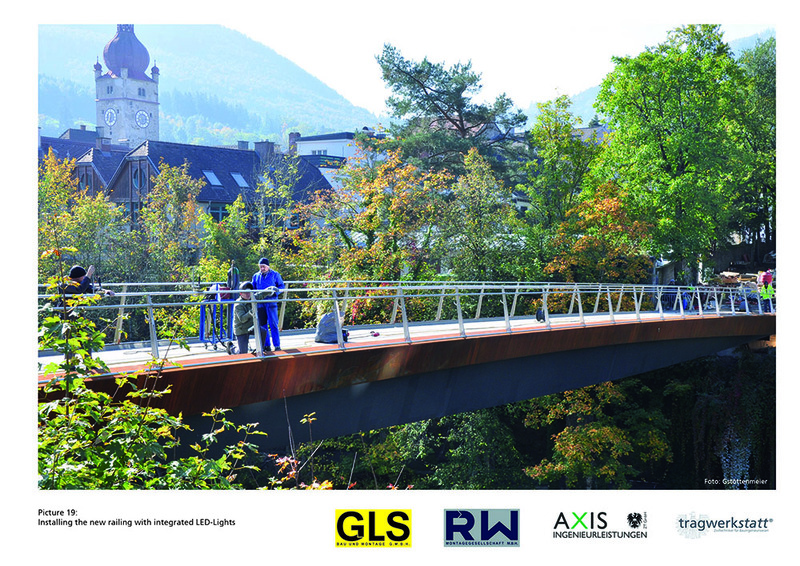 Schlosssteg 2.0 is manufactured of weathering steel, takes up the “Genius Loci”, harmonically blends in the historic ensemble and contributes essentially to the local construction culture. By manufacturing close to the construction site the principle of short distances could be literally applied. 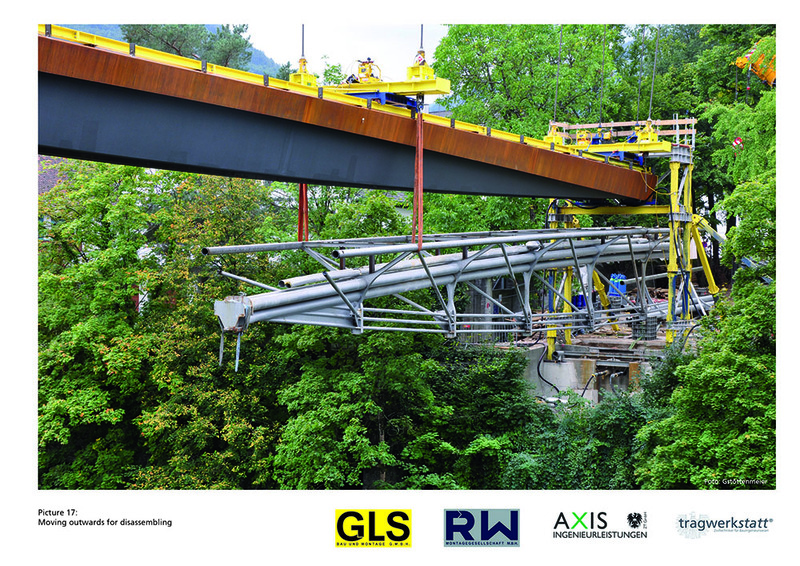 Since many components could already be prefabricated, the complete Schlosssteg was transported to site by just six flatbed trucks. In order to reduce the environmental impact and to keep the usage of new material low, the existing abutments of the old bridge were reused and just adapted to fit the new structure. 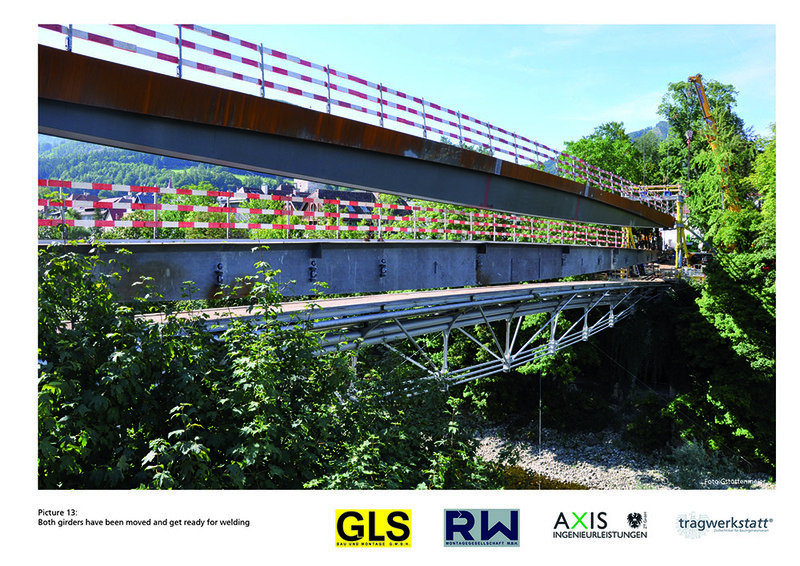 Already during the design phase an optimised construction concept was custom-tailored to the local requirements, incorporating the existing bridge in the installation of the new bridge. Hence, the complete installation could be carried out “from above”. It was not necessary to intrude on the sensitive riverbanks of the Ybbs. This “non-invasive” installation method allowed for the smallest possible impact on the environment. Well-proportionate shapes create elegance. In bridge construction, this is achieved by slender structures. 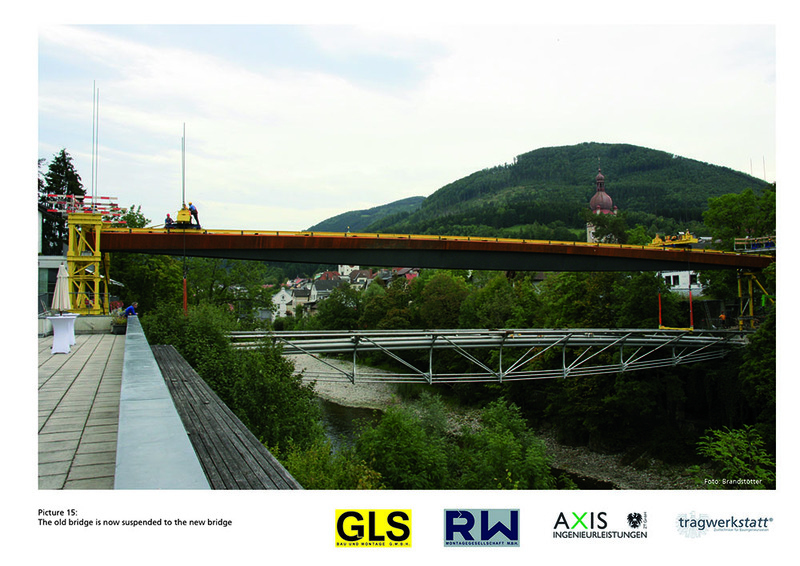 Schlosssteg 2.0 has two main and two edge girders with different surfaces. The edge girders are of raw weathering structural steel, which develops an optically appealing umber patina, and does not require any maintenance work during its entire service live. The edge girders form the “visual interface” and let the eyes of the beholder smoothly glide over the Ybbs. The two main girders, however, form the static backbone of the construction and are therefore higher than the edge girders. To optimise visual slenderness, the edge girders are in front of the main girders, making the main girders virtually disappear in the shadows. The main girders were painted dark grey to increase this effect. The railings are those parts that are directly touched by the bridge users; therefore they were made of stainless steel. Moreover, no corrosion protection was required for the railings, creating a durable and low-maintenance construction. Another innovation was the filling of the main box girder with quartz sand at dynamically favourable positions, which was already taking into account in the statics calculations. This solution could be used to reduce vibrations caused by pedestrians. Therefore, it was not required to apply expensive tuned mass dampers. 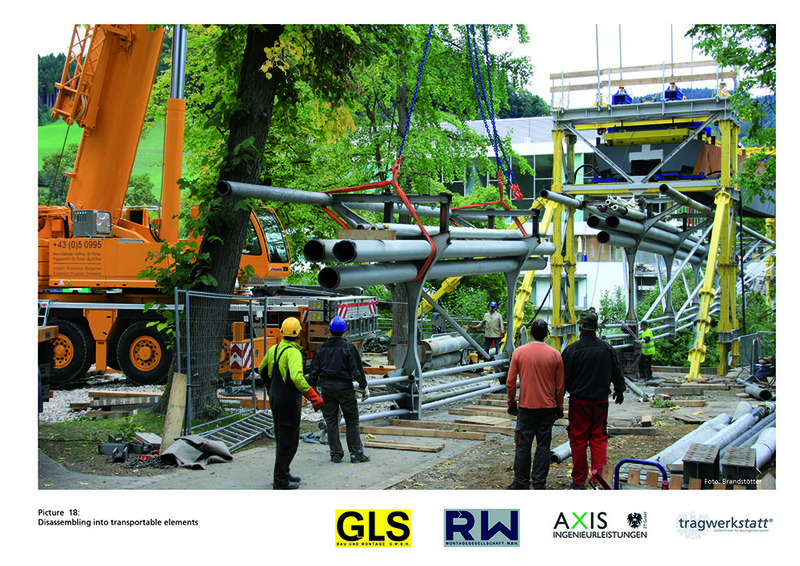 The erection of the new Schlosssteg included the deconstruction of the existing structure while maintaining the existing power lines and district heating ducts. Moreover, during the complete process, special consideration was put on the environment, due to natural monument and preservation reasons. By consistently implementing a holistic design strategy, all these – partly contradictory – requirements could be met. In particular the process of erecting the new and the deconstructing the existing structure were taken into account in designing the new bridge right from the beginning. A “non-invasive” installation concept was developed already at a very early project stage. 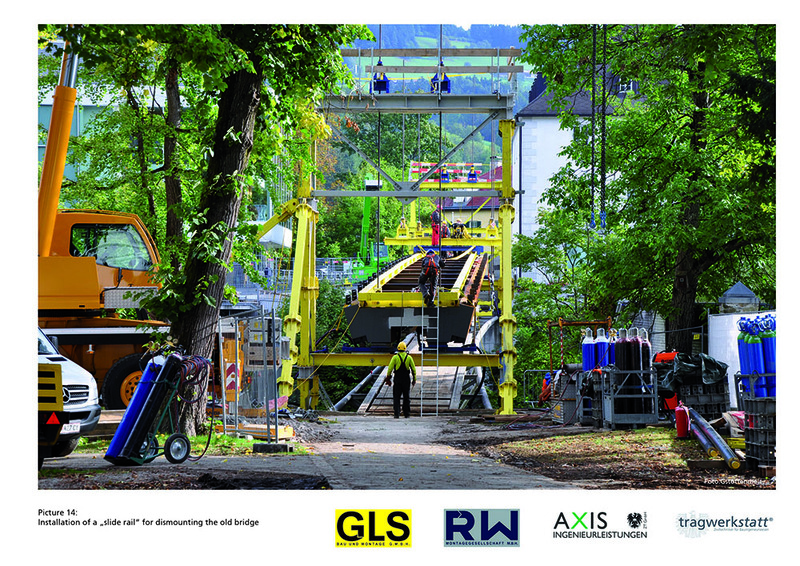 To this end, the existing structure was incorporated in the installation of the new bridge, and – vice versa – the new bridge was used to remove the old one, resulting in a unique construction concept running like a thread through all project phases and eventually reflecting the uniqueness of the new Schlosssteg at large.